Diving for Pearls: Single Malt Report: Inchmurrin 12 year old Unpeated (2014) and what is Inchmurrin single malt anyway? Single Malt Report: Inchmurrin 12 year old Unpeated (2014) and what is Inchmurrin single malt anyway? On Monday, I reviewed the new Loch Lomond NAS Original. In that post I referenced that the Loch Lomond distillery makes a number of different whisky styles and brands in house, thanks to their unique (pot, Lomond, and Coffey) stills configuration. Today I'm reviewing a 2014 bottling of another one of their brands, Inchmurrin, named after an island in the loch itself. Now what Inchmurrin is (style, brand, production process) exactly, I don't know. The internet hasn't been very helpful in my searches. Whiskybase does call it "Unpeated". And Charlie Maclean references a couple of things in his Whiskypedia book: Inchmurrin was originally made from the Lomond stills, and the spirit was designed to age quickly. The former may no longer be true, while the latter is of course the Great Big Hairy Candy-Coated Grail all of whiskydom continues to chase. To add to the confusion is the ever-changing Inchmurrin packaging design. See below for the 5 versions that have existed over the past 10 years. To be fair, or more confusing, that first bottle type -- the "Distillery Select" -- was actually for all of Loch Lomond's single malts since it was designed for the single casks (not at cask strength) they'd release. All the Distillery Select bottles appear exactly the same from a distance, with the info on the little white label marking the only difference between each release. Five different bottles, one decade. From a marketing or (more importantly) the customer's standpoint, what does an Inchmurrin look like? A little visual consistency goes a long way to help a brand. For instance, we all know what a Glenfiddich or Ardbeg bottle looks like from across the shop. Johnnie Walker's bottle & label helped create and sustain the largest whisky brand in history. Thus it wouldn't hurt if Loch Lomond Distillery Company picked a visual style and stuck with it. 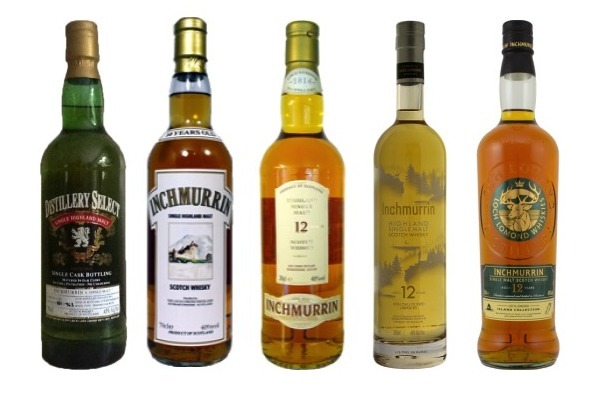 The Inchmurrin I'm reviewing today is the fourth bottle from the left (above), probably the artiest of the bunch, though difficult to photograph, and a little difficult to read. While I like that bottle design the best, it lasted all of TWO years before they changed it again. Its color is a very light straw. A remarkably clean nose for a Loch Lomond product. Roasted barley, lemon juice, fruit cocktail juice, rock candy, and apple juice. A little bit of polyester and new car. Small notes of vanilla, honey, and moss. The palate holds bitter melon rind, lemon peel, and barley. An intense earthy note meets up with fresh arugula. A hint of peaches. This all gets delivered with a nice oily mouthfeel. The finish registers as soil, grass clippings, and hay upon first sips. Later on it's burnt barley and fresh ginger. Ta-da! A good Loch Lomond single malt. Hell, it's the best I've had. Even if it is unpeated, it's very earthy and organic. It's also nearly devoid of oak influence, with lots of barley dancing around in lieu of the cask. It also does a good job balancing fruit notes with the industrial stuff. I won't say this is a world beater, but it sure can compete with (and beat) most official 12 year olds from better-loved distilleries. Hopefully the producers kept the whisky the same when they changed the label last year. I really like this Inchmurrin, and I've been quite vocal about it! I'm as flabbergasted as you are about LL burning through bottle designs (nice line-up photo! ), and especially for not sticking with this 2014 winner! If you look at your photo the 2014 stands out like a swan in a poultry farm. As for the new one, not only is it ugly and uninspiring (at least from a distance), but that orange color, confirmed by others who had it, does not bode well at all. The 2014 glass container is heavier (a shipper told me it's 200g heavier than others), and probably more expensive as well, so the latest may have been a cost-cutting move for the distillery. Forget style, quality, and luxury, let's go back to the bottom shelf! "Surprisingly good, with citrusy sweetness and bitterness (lemon, grapefruit? ), savory and appetizing, depth of flavor, different and not boring. Would get a few more bottles in a heartbeat! 84pts"
Does that fourth bottle look like a Buffalo Trace Antique Collection bottle? That might explain the bottle change but the newest version is similar to a design used by other distilleries. There are quite a few out there using this bottle shape, I doubt that's grounds for brand infringement. For example, all Copper & Kings' brandies. 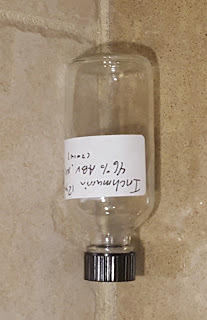 It makes sense that bottles are not owned by the distilleries (except maybe Glenfiddich since the triangle bottle is distinct) but it's weird that so many distillers are buying from the same or similar glass maker since that bottle design is quite common. Economies of scale. Same reason most wine bottles are nearly the same.